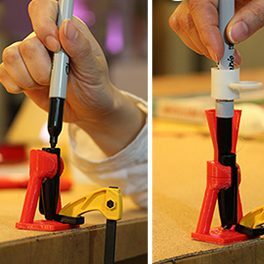 Reprise is a tool for creating custom adaptive 3D printable designs for making it easier to manipulate everything from tools to zipper pulls. Reprise’s library is based on a survey of about 3,000 assistive technology and life hacks drawn from textbooks on the topic as well as Thingiverse. Using Reprise, it is possible to specify a type of action (such as grasp or pull), indicate the direction of action on a 3D model of the object being adapted, parameterize the action in a simple GUI, specify an attachment method, and produce a 3D model that is ready to print.